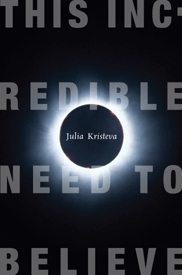 I picked up a copy of Julia Kristeva’s recent little book on faith, This Incredible Need to Believe (October 2009) at Melbourne’s wonderful bookstore, Readings (on Lygon Street). Through the lens of psychoanalysis, she attempts to answer that gargantuan yet pressing question of how a secular society can justifiably defend religious or moral foundations, without being trapped into either an adolescent fundamentalism or equally adolescent nihilism. Indeed, how to know this without deluding oneself? Kristeva’s essential answer is that understanding ourselves – in particular our basic psychic makeup, as revealed by psychoanalysis – reveals necessary psychic beliefs and morality. So with recourse to these psychic needs, secular society can defend morality while avoiding a return to the irrationality of religion (“very often in bastardized (sects) or fundamentalist… forms”) or the emptiness of nihilism. But a problem seems to remain with her ‘solution’ . For, at most – and if we accept her psychoanalytical reasoning for a moment – if we have psychic needs which underpin faith and morality, this only leads to the conclusion that there is a psychological necessity for some form of morality. But the ‘problem’ faced is rather different: secularity is unable to provide an ultimate basis for any particular moral standpoint. And this particular ‘problem’ cannot be overcome by any psychic necessity. This involves the illicit progression from a descriptive to a prescriptive. More concretely, Kristeva’s solution does not allow us to judge between the ethical standpoints of Wahhabism, Nazism, or the new humanism which she herself expounds. It is no wonder, then, that liberal humanism only flourishes in police states, where violent force rather than psychic necessity dictates the acceptable form of ethics. I read This Incredible Need to Believe on the long plane trip back to Dunedin from Melbourne, along with a new novel by Don DeLillo, Point Omega.